This amazing, newly remodeled home will not disappoint! Settled in the bay of Diamond Lake ~ Enjoy 75 feet of sandy waterfront on a quiet bay to enjoy swimming, kayaking and fishing! Bring your boat ~ Have fun waterskiing, tubing or just cruising around the beautiful 1,078 acre all-sports Diamond Lake. Our backyard beach and pier are only steps away from our back door! This home was completely remodeled with multiple additions, including the 4 seasons room. Fresh paint and flooring throughout the house as well as new kitchen and appliances, new washer/dryer, and additional master suite all new in 2015. Other amenities include fireplace, high speed internet and WiFi, cable and public water. Located in the cul-de-sac of a lightly traveled road, plan to bring your bikes for a nice evening ride or play a friendly game of basketball on the adjustable hoop in the large driveway. This home can be enjoyed year round! Whether you prefer the beach and the sun or ice fishing and hockey, this home is wonderful at all times throughout the year. The colors are beautiful in the fall, especially when you're taking them in next to the fireplace in the four seasons room. Just a short jaunt to the campus of Notre Dame, this home is perfect for visiting the University for activities on campus. A very family friendly home with enough space for multiple families to stay comfortably. Located near Swiss Valley Ski Resort and Dr. Lawless park which offer fun winter activities such as downhill and cross county skiing, tubing, hiking and snowboarding. In the summer months our change over day is Saturday, so all rentals will run Saturday-Saturday. We have lived in the area all of our lives and enjoy time spent at the lake. 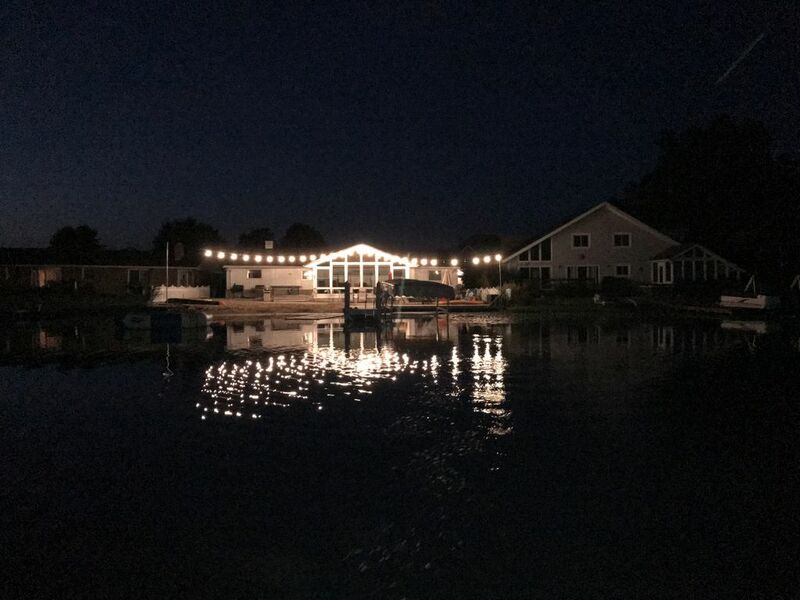 As a builder and property manager, we decided to invest in our own lake home after renting others for years. With our experience, we have made this home everything we'd want it to be for our family for an amazing vacation. Diamond Lake is an amazing lake known for it's multi-million dollar homes that line the lake shore. As much as we love life at the lake, we also love a peaceful and serene atmosphere. We chose a house on the bay as it is the perfect spot for kids to enjoy the sand and water as well as having access to the fun and busy water sports of the big lake. It really is the best of both worlds! With two master suites, this home is perfect for multiple families to enjoy at once. There are no stairs or long walks to the beach, only steps from the back door. Indoor towels only. Please bring beach towels for outdoor use. Flat screen TV and fold out couch for additional sleeping. New cabinets, appliances, flooring. Includes dishwasher, microwave, toaster, dishes, utensils...fully equipped! Awesome home for a family trip! While we didn’t get to enjoy the home as much as we would’ve liked because we were in town for a wedding, what an awesome place!! Large enough gathering space for your family and what an awesome backyard!! It has a cute little beach, I can only imagine how fun it would be in the summers. I recommend this home to anyone looking for a fun family weekend! We had the most perfect time at our family reunion in the Shier home. There was plenty of space for everyone and we didn’t want for anything. The backyard beach was PERFECT for the kids AND adults. I definitely recommend this property!! Thank you for taking the time to give us a great review! Glad you and your family enjoyed your time. We have an amazing time every year! This is our third year renting this property on Diamond Lake and plan to return again next year. The house is fantastic. The location on the lake is great for kids. From the water trampoline to the kayaks, the kids had plenty to do. The owners are wonderful....we sincerely enjoy renting from them every year. 20 minutes from the Notre Dame campus and large shopping centers including many restaurants, grocery stores and other entertainment opportunities. Less than 20 minutes from Swiss Valley Ski & Snowboard Area. Lake Michigan shoreline is approximately 30 miles away and Chicago is less than a 2 hour car ride.